Guest post time! 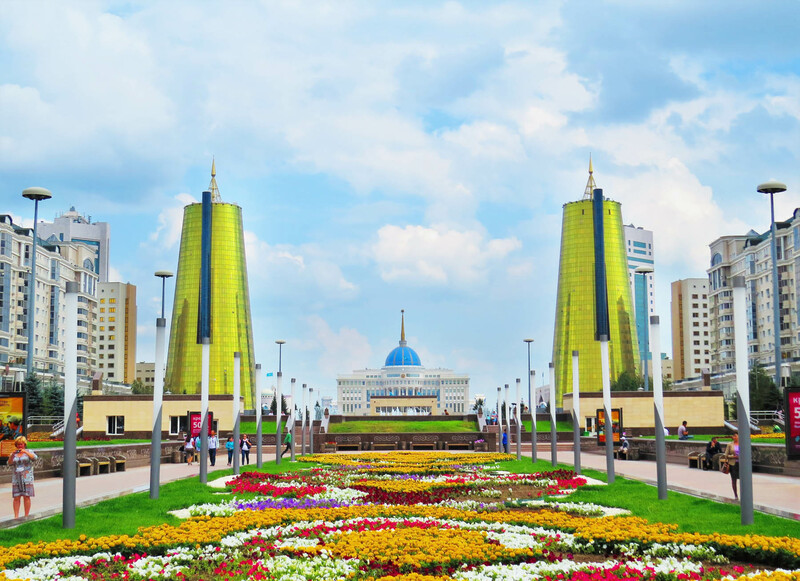 The eccentric capital of Astana is a key stop on many a traveler’s Kazakh adventure. 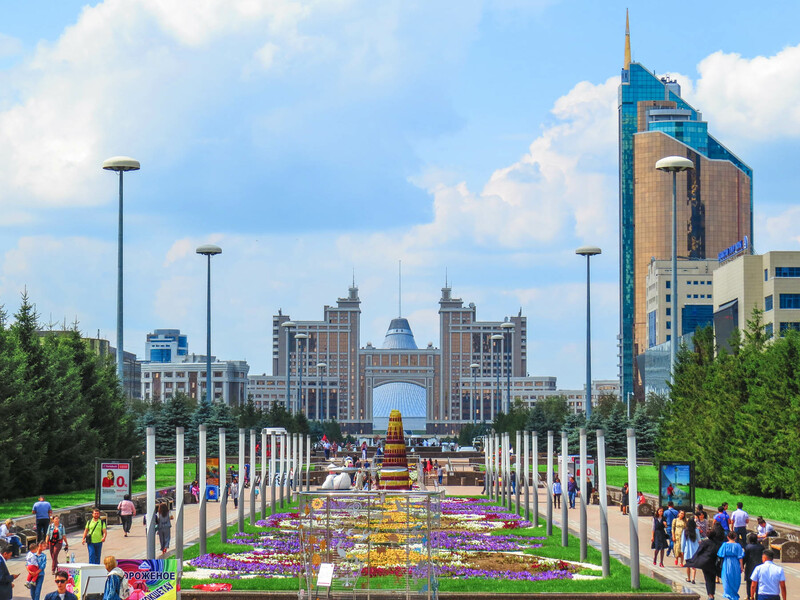 Here are 6 things to do in Astana, Kazakhstan, as brought to you by the bossy couple behind The Travelators. The truth? Dubai with a Central Asian twist. On our journey to Astana, we wondered why the hell anyone would build a city here. Founded in 1830, it was merely an outpost at the time, a tiny speck on the vast Kazakh steppe. In winter, temperatures plummet below -30°C as icy winds blast across the flat terrain. The area was previously used for gulag camps and nuclear weapons testing. … not exactly prime real estate for a capital city. But Kazakhstan’s president, Nursultan Nazarbayev, thought otherwise. He declared Astana the shiny new capital of Kazakhstan in 1997, replacing the southern city of Almaty. Astana was to showcase the former Soviet state’s progress and newfound wealth to the world. It’s certainly met its mandate: there are extravagant futuristic metal and glass skyscrapers, government buildings, and hotels peppering the city. Walking along the main thoroughfare in Astana, we felt like stars in a sci-fi movie. Sounds intriguing? Here are 6 things to do if you decide to head to Astana. While oil and gas may be financing the grandiose buildings in Astana, people are Kazakhstan’s real wealth. Kazakh people are amongst the friendliest we’ve met in our travels. Beneath the glitz and glamour is a population that endured conquest, famine, forced labour, and dictatorships, yet somehow kept hold of a strong national identity. To get in with the locals, tap into Kazakhstan’s active Couchsurfing community. Catch up for a coffee with a local Couchsurfer to learn more about life in modern Kazakhstan, and the traditions that remain. We met up with a young Kazakh guy who told us how his mother had been ‘bride-napped’ by his father, a controversial practice still occurring in Kazakhstan’s far west. We also had coffee with a young Kazakh who explained how Kazakh people traditionally know their full family history, seven whole generations back. Impressive! Looking for more Kazakhstan inspiration? Check out Lost with Purpose’s two-week Kazakhstan itinerary! It looks strange, but… Photo by Peretz Partensky. Kazakh food is centred around horse meat and mutton. We admit it doesn’t sound that appealing, but you can’t come to Kazakhstan and not try the national dish besbermak. Besbermak is basically boiled horsemeat or mutton, chunks of fat, and flat noodles. Horsemeat is considered a delicacy in Kazakhstan, so if you are served it in a family home feign some excitement! A bowl of toe-curling broth mixed with yogurt is served with the dish, to cleanse the stomach after your meal. It’ll put hair on your knuckles! Besbermak is found in some traditional Kazakh restaurants in Astana (like Fahri Restaurant), but it’s best tasted with a Kazakh family at home. Astana is home to some of the most futuristic and over-the-top buildings we’ve ever laid eyes on. Buildings you can’t miss include the Bayterek monument, a huge tower topped by a nest of white metal and a giant golden orb. The enormous, translucent tent Khan Shatyr is another must-see. The state-of-the-art energy saving design ensures the building stays comfortably warm without artificial heating even in the depths of winter. The National Museum of Kazakhstan (500 tenge entrance) has recently been renovated, and is quite impressive. We spent a couple of hours wandering through the exhibits, which tell the story of Kazakhstan from pre-historic to modern times. The most moving exhibit for us was a simple lump of bread. The exhibit told of a Kazakh grandmother who survived the famine of 1930-33. She described in haunting detail how she ached for just a single crumb as a child during the famine. To this day, she carries a piece of bread in her pocket. The famine claimed the lives of an estimated 1.5 million Kazakhs. The final exhibition hall is a rather strange propaganda-ish ode to president Nursultan Nazarbayev, Kazakhstan’s only leader since independence in 1991. There have been elections since Kazakhstan’s independence, but none met international standards. Nazarbayev’s share of the vote exceeded a laughable 97% at the last election. Take the exhibits in this hall with a pinch of salt! Hazrat Sultan Mosque is the largest mosque in Kazakhstan, and the second largest in Central Asia. The mosque was opened in 2012, but has all the grandeur of older mosques in the region. It’s located right next door to the National Museum of Kazakhstan and the Palace of Peace and Reconciliation. There’s a growing appreciation for craft beer in Astana—a number of microbreweries are popping up across the city. While the range is still fairly limited, it makes a nice change from vodka and fermented horse milk. We had a great steak and a few brews at Line Brew, which is a favourite for expats in Astana. But there are plenty of other options including Pivovaroff and The Barley. Enjoy! Hi there! We're Tom and Katherine, a couple from Australia. We've been backpacking the world together on-and-off since 2007, juggling our love of travel with study and work at home. Our blog is all about taking career breaks to travel, and exploring the world on a budget. We've visited over 60 countries so far across Europe, the Middle East, the Americas and Asia – and we're still counting! Follow our journey on our website, The Travelators, and connect with us on Instagram, Pinterest, Twitter and Facebook. Interesting! Do you know why that was? Cold people? Weird vibes? We didn’t make it to Astana (it’s just so far from Almaty if you don’t fly), but we’ve mostly heard good things about it until this point. Definitely cold people and just the vibe was really awful. I went there before anyone else had really trekked there, so I had no opinions beforehand to live up to so every experience was competely raw. I hear the city has come a long way, but almost everyone I know who has since lived there or visited said it was still pretty void of culture. I usually like almost every place I visit, especially when around locals (I was around them in Astana), but this was just one place I couldn’t connect with at all. Both side of the bank… the old and new. I really hope that everyone visiting from here on out has the total opposite experience with the place! That’s a shame. Hopefully things are a bit different now, especially since Kazakhs in other places are so warm and welcoming. I’m up for trying exotic food and besbermak seems one dish that’s up my alley! Astana looks really gorgeous and makes a great contrast to the more ancient city of Almaty. While you’re at it, you can volunteer you and your loved ones for ritual abuse and Satanic child sacrifice. You people are crazy to think nobody sees what you’re doing. Well clearly you know what’s up! Gotta keep my Satanic rituals on the DL it seems. Heya! Alex here, a twenty-something backpacking lass traveling full-time through truly offbeat destinations. I share my experiences along the way to inspire you to do the same!